Once you sit down in the cool long room of Rowland's Bar & Grill, it's easy enough to forget you're on the One Below level of Macy's flagship store at Herald Square--which, I'm told, is the most visited tourist spot in NYC after the Empire State Building (on 34th Street) and the Statue of Liberty. It's a sleekly handsome place with a long bar and open kitchen, very roomy coffee-colored booths, spanking white tilework and brick, and both excellent lighting and sound levels, which makes it an equally appealing venue to talk business, have a date, or just relax right after work. The waitstaff is cordial and the pacing of a lunch or dinner can be whatever you choose it to be. O.K., that caveat aside, Rowland's is decidedly what it says it is--a true bar and grill, named after the store's founder, Rowland H. Macy, who had always insisted his stores serve first-rate food to its customers. Indeed, Macy's pioneered the food hall concept in a department store, and in addition to Rowland's, the adjacent space is given to five wonderfully configured indoor streamlined food trucks (they don't budge) called Chef Street ,featuring stations under notable chefs like Michelle Bernstein, Takashi Yagehashi and Marc Forgione; on the sixth floor is the fine Italian restaurant Stella 34. 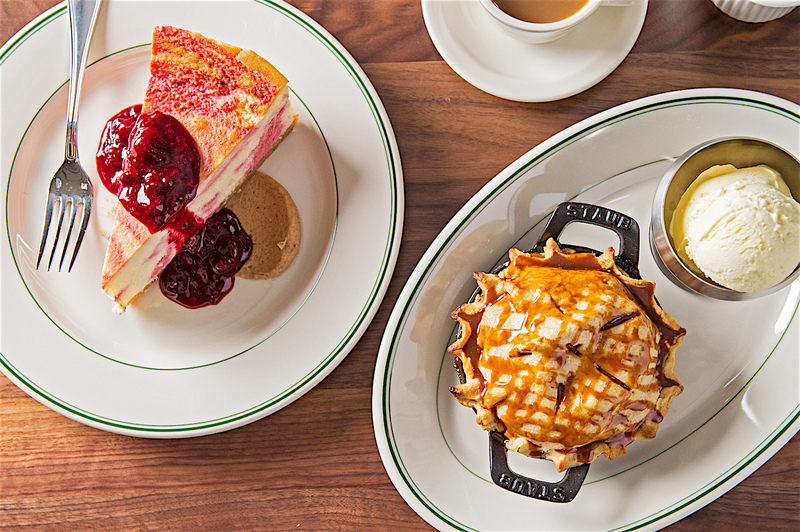 Rowland's menu itself is graphically free of incidentals or gibberish and shows off the breadth of American food grounded in NYC food culture. Thus you might start off with some very good cured salmon and bagel chip board with tomato, capers, red onion, and scallion-riddled cream cheese ($13) or a hearty matzoh ball soup with plenty of slivers of roasted chicken and baby kale ($9), the broth wholly suggestive of why this is called "Jewish penicillin." 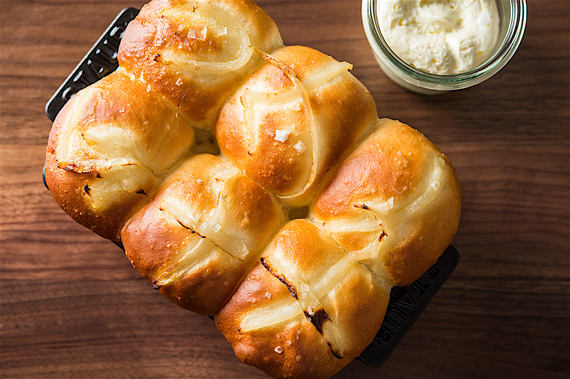 No one complains about the four dollars for the house-baked pull-apart onion bread (above) served in a cast-iron mold with soft, churned butter because these six yeasty rolls could become as famous in NYC as Parker House rolls did in Boston. Heading South, the menu includes crisp fried green tomatoes with thyme-flecked fresh ricotta, pickles and onions ($14) and some really excellent heads-on shrimp with true stoneground grits and a spicy chorizo vinaigrette ($15), a dish hefty enough for a light dinner. There are eight salads ($10-$19), including two lavish chopped varieties. It's always great to see a properly steamy, moist baked potato on a menu, here served with scallions, bacon, sour cream, and cheddar ($8), and the nicely cooked, tender Brussels sprouts are as good any in town, enhanced with shallots, pancetta, and a touch of tangerine honey ($8). One order of buttery mashed potatoes topped with crispy fried, battered onions ($8) will easily feed two or three people, and the steak fries ($8) are, as expected, huge and have good flavor but, as usual with these monsters, lack the crispness of French fries. 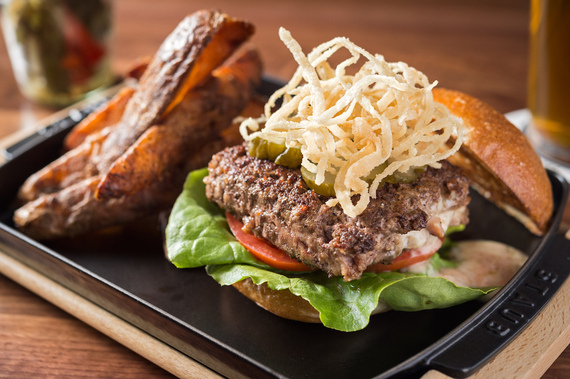 The kitchen crew worked very hard to get the burger meat blend right and it shows: the fat content, the succulence, and the way it's loosely packed all show attention to detail at a time when hamburgers have become extravagant ego fantasies all over town. 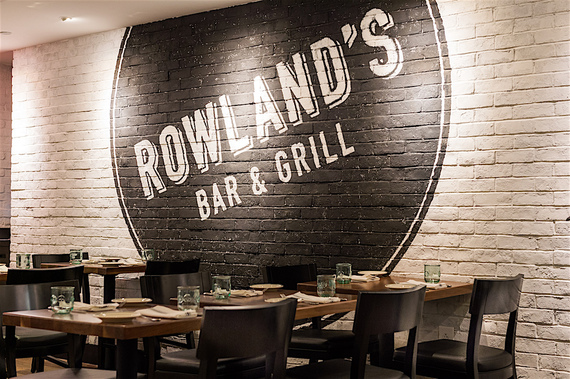 Rowland's (below) is set on an Amy's egg-rich, faintly sweet challah bun ($16); there's also a signature RH Burger in which the beef is blended with bacon and topped with Comté cheese and onion ($19). It seems odd to have a pork banh mi ($18) listed, especially on that challah bread with Napa slaw, pickled vegetables and a spicy mayo. I think it might be better on the menu at the Asian food truck next door. If you've been looking for the ideal BLT, you may well find it here, again on one of those buns, with Sriracha-honey glazed bacon, crisp lettuce, ripe tomato and spicy mayo ($16). 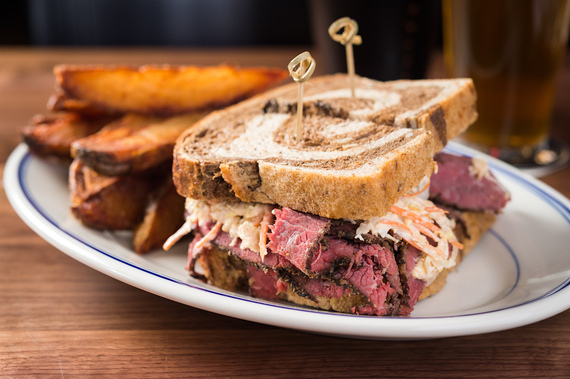 And for those who moan that pastrami making is nearly a lost art, even in NYC, try the version at Rowland's' (above) I think you'll be amazed. It's served with horseradish coleslaw, Thousand Island dressing and marble rye ($18) in the best Seinfeld tradition. The fish have true flavor here, from halibut with an irresistible fresh corn-studded polenta with spring onions ($26) to true Scottish salmon with herbed quinoa, English peas and pickled vegetables ($24). They've recently added fish and chips ($24), but I haven't tried that dish. I have, however, enjoyed the fried half chicken with admirably crispy skin ($24) and the gently priced steak frites ($29) with caramelized onions. Rowland's calls its half rack of meaty ribs "St. Louis" style ($28), but for all its sweet glaze, to me it seemed to derive more from East Asia's food stalls. The five desserts are strictly for kids of all ages and wonderful for that: RH apple pie oozing sweet-sour apples with caramel sauce and vanilla ice cream ($14); a very rich cheesecake with Graham crackers, summer berry compote and Belgian speculoos wheat cookies ($8); house made ice creams and sorbets ($8); and a smile-inducing ice cream sandwich with chocolate chip cookie ($8). And then there is the decadent Brooklyn blackout devil's food cake, with chocolate mousse layers, cookie crumble and vanilla whipped cream, which at least three forks can have a go at for only $8. It somehow manages to be dense and moist in equal measure, and the chocolate itself is intense. Prices at Rowland's are kept very much in mind across the board (of course, there's a children's menu, and you may order something from the food trucks), with all cocktails $13, and wines offered by the quartino carafe or bottle. Mark-ups for the least expensive wines are higher than for the more expensive ones, like a Joseph Phelps Pinot Noir at less than double the store price. You may stumble across Rowland's on your way through the clothing racks--signage is minimal--but once you find it you'll feel that you've come not just to an oasis but a very happy place to find solid American cooking.